CL: I have a lot of mixed blood in my heritage. My father’s side of the family came from Northern Spain – Basque and Jewish Sephardic people. My mother’s father came from Andalusia, and all the Andalusians have Arabian blood. But on my mother’s family, my grandfather – his grandfather was Chinese and his grandmother was Japanese. I am proud of my heritage. I believe it is very rich. I respect where I come from because I think a man without a past is a man without a future. 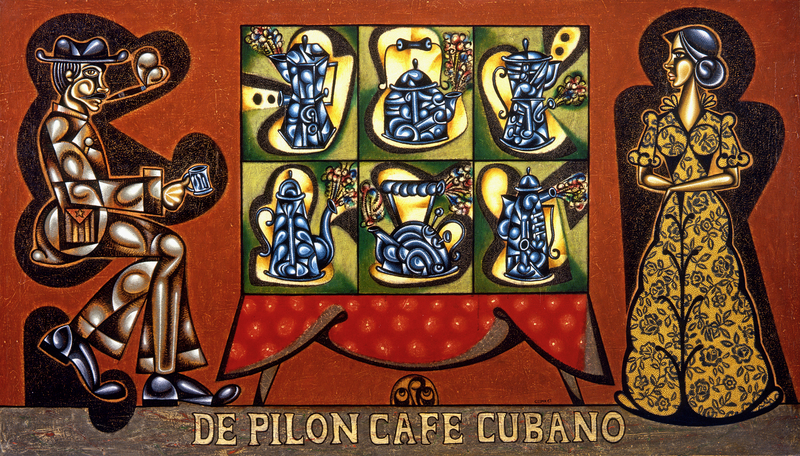 “Stone Pressed Cuban Coffee” by Carlos Luna (oil on canvas, 48″ x 84 ½”) ©2004 Carlos Luna. All Rights Reserved. AM: Is your family still in Cuba? CL: Only my father, my step-brother and my step-sister. My two sisters, my brother, and my mother live here in Miami. 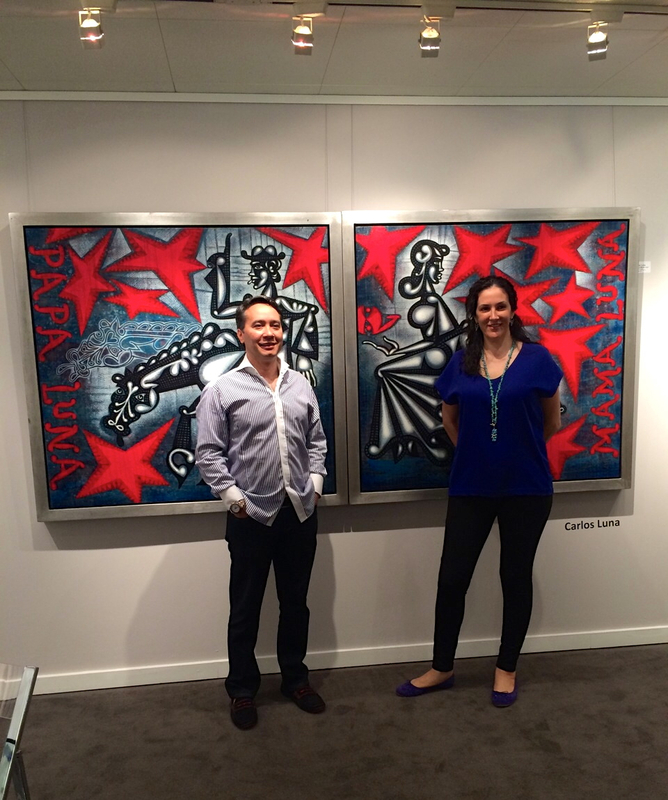 Carlos Luna’s work “It’s Time for Us to Talk” (oil on canvas, 66″ x 78″) ©2003 Carlos Luna. All Rights Reserved. AM: What was your first exposure to art? CL: Everyone in Cuba has a religious room or space in the house dedicated to practice their religion. My grandmother had three particular images of Jesus Christ. One was the painting by Velázquez. The second was Jesus Christ by Andrea Mantegna; you saw Jesus Christ from the feet – lying down. And the third was by Grunewald. It was a dramatic Jesus Christ. My grandmother was a very quiet, delicate woman and she had the three images of the Beato de Liébana. The Beato de Liébana illustrated the Apocalypse. These were impressive images because they marked my development and my visual preferences as a future artist. 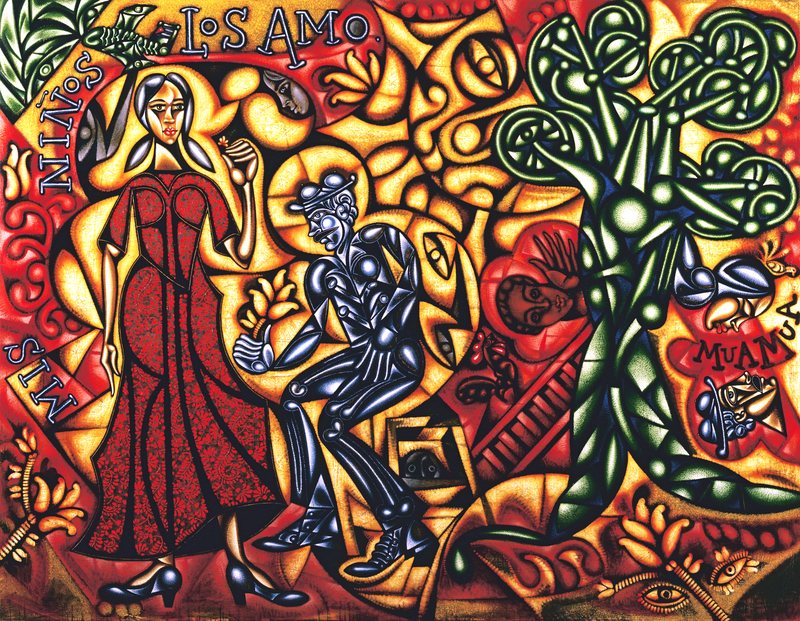 Carlos Luna’s six-piece work, “The Great Mambo” (144″ x 192″, oil on canvas) ©2006 Carlos Luna. All Rights Reserved. AM: When did you first start making your own artwork? CL: I’ve always been drawing and painting. My dad and I both had a strong temper and we always butted heads, so I began my artwork by making cartoons of my dad. These cartoons were always some sort of a story. To me, it was like my own private space where no one knew what I was doing or what I was saying. Untitled work by Carlos Luna (mixed media on paper, 23″ x 30 1/2″) ©2012 Carlos Luna. All Rights Reserved. AM: You studied art in Cuba. What did you learn from that experience? CL: Art education in Cuba, during the time I was there, was very rich. I think I received a really good art education. But maybe God gave me the gift to be able to filter and figure out what works for me. Each class taught me what to do or what not to do. But I think it’s impossible to find a school that makes the artist. AM: Why did you leave Cuba to go to Mexico? CL: To be a free man. Every human being is born with the ability to be free, but only a few people decide to live freely. In Cuba you don’t have freedom. I was born in Cuba. I suffered in Cuba. You are not free in Cuba because all the time you have to be very careful with the way you say things and who you say things to. You have someone constantly watching over your shoulder. That life was not for me. Now, I am a free man. 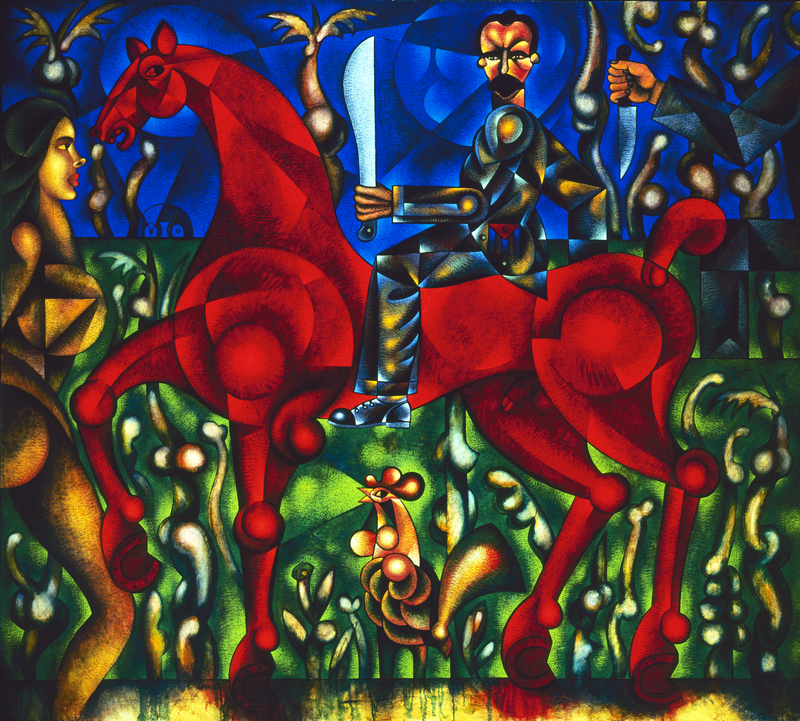 “The Apostle Decides to Immigrate” by Carlos Luna (oil on canvas, 58 1/2″ x 78″) ©1996 Carlos Luna. All Rights Reserved. AM: Why did you choose Mexico? Did you know people there? CL: No, the owner of a gallery went to Cuba because there were a lot of international galleries that focused on Cuban art. He had my name, he found me, and he offered me a good contract. I was very young, 20 years old. I lived one year in Monterey, North of Mexico. The next year I went to Mexico City, which is where I met my wife, Claudia. At that moment I had been ready to leave Mexico, but love is very powerful. I found Claudia, and thank God I married Claudia. AM: Tell me about your career in Mexico. CL: Cuba is the country where I was born. And Mexico is the country that I chose. For the first time I felt in control and I could have a career without being tied to anybody or anything. I understood at that point that I was able to make choices as to what to do with my art and what to do with my career. I was free and independent. AM: Did your art change when you went to Mexico? CL: I don’t believe in change, I believe in transformation. 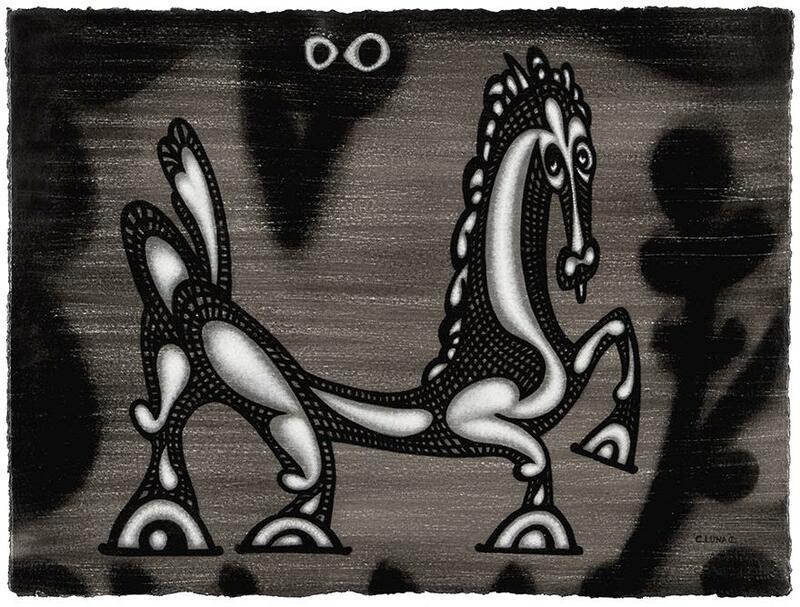 I love Mexican art and the history of Mexican art. I think Mexico enriched my work; it gave it power, and filled it with life. It enriched my work because it enriched my personal life. I got married, my princess was born, and my life transformed. My interests were focused on my family, my wife, my art, my friends, my choice, my dog, my flowers, and my tree. It was a simple life for me. Mexico reminded me of living with my grandparents – of the life I had there. “My Light” by Carlos Luna (oil on canvas, 45″ x 76″) ©2013 Carlos Luna. All Rights Reserved. AM: Since you immigrated to the U.S., what have the highlights of your career been? CL: Cuba today doesn’t recognize my career. It doesn’t matter to me. I feel comfortable. I know who I am. But this country offered me U.S. citizenship for extraordinary ability, and my family came to the United States because my career was recognized. Wow. I think this is an incredible country. My career in this country grew fast. Intellectual and cultural people found my work rich and were interested in my work and bought my work. Today I work in this dream of a free man and an independent man. It’s incredible. AM: How do you get ideas for your work? 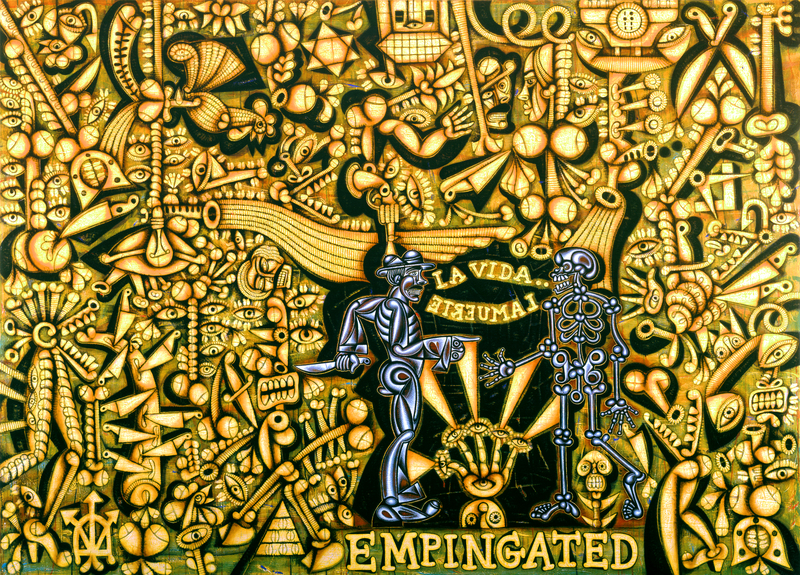 “Empingated” (“Freaking Awesome”) by Carlos Luna (oil on canvas, 67″ x 94″) ©2008 Carlos Luna. All Rights Reserved. AM: Tell me about some of the religious imagery that appears in your paintings. CL: Some pieces have symbols and elements and ideas from different religions – not only the Catholic religion. 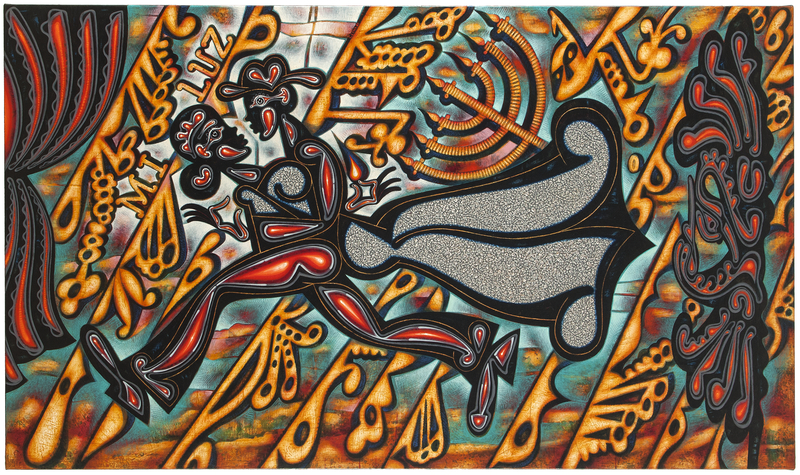 For example, in Empingated you find an element of Afro-Cuban religion – the bow and arrow. That symbolizes justice by a saint named Ochosi. It’s a weapon that he uses to defend himself. The knife is another saint, Ogun, because the weapons belong to him. There is the Star of David, the huge star, because I have Sephardic blood in my past. The pyramid is for masonic people because my grandfather was a Grand Master mason. There is also a Yoruban symbol and a sacred heart. I put in a lot of symbols because of all the symbols in my heritage. When I put together all the symbols, the result is a very strong spiritual vibration. “My Secret Leads the Way” by Carlos Luna (39″ x 31″) ©2000 Carlos Luna. All Rights Reserved. 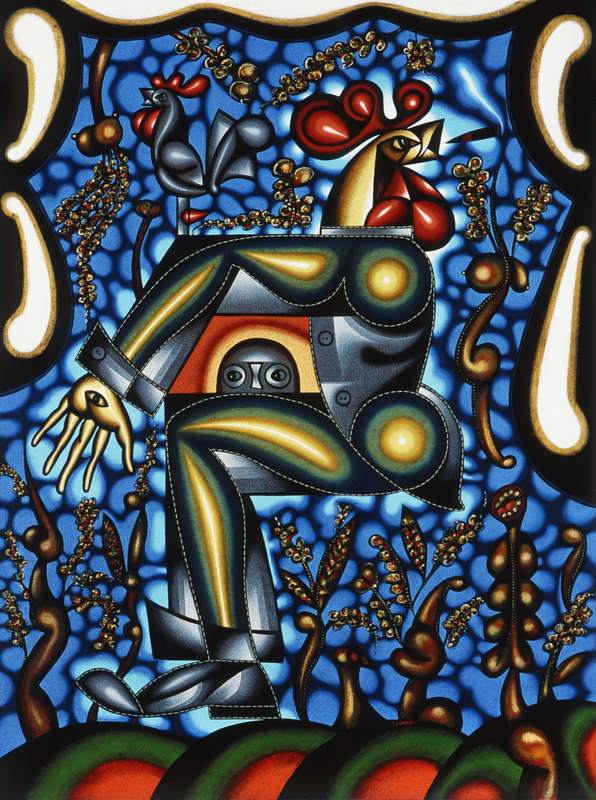 AM: The rooster appears in many of your paintings. What does it signify? CL: When I was a child in my town the cockfight was a very important tradition. Fighting roosters was illegal in Cuba because the government didn’t want places where people could get together without them having control. So everyone who went to the fights would let out their anger and their personal issues with the government and their lives. And the rooster gave many people the means to tell their own stories. The rooster was the star. That strengthened my idea to become a storyteller. In another, way the rooster is an original creator because he sings in the morning to announce the beginning of a new day and he also sings at night to announce the end of the day. 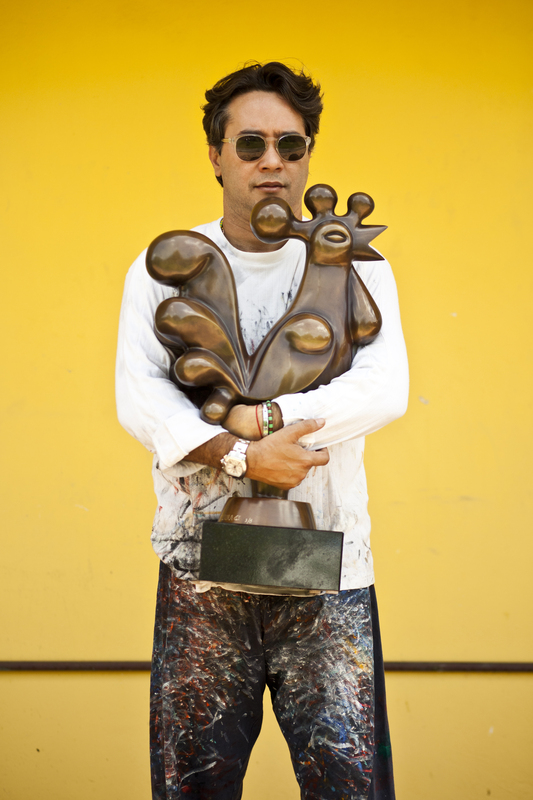 Many people have seen machismo represented by the rooster. But what no one has really noticed is that when I have a rooster next to a woman, the rooster is always smaller than the woman. And I consider that the real heroine is the woman, not the man. 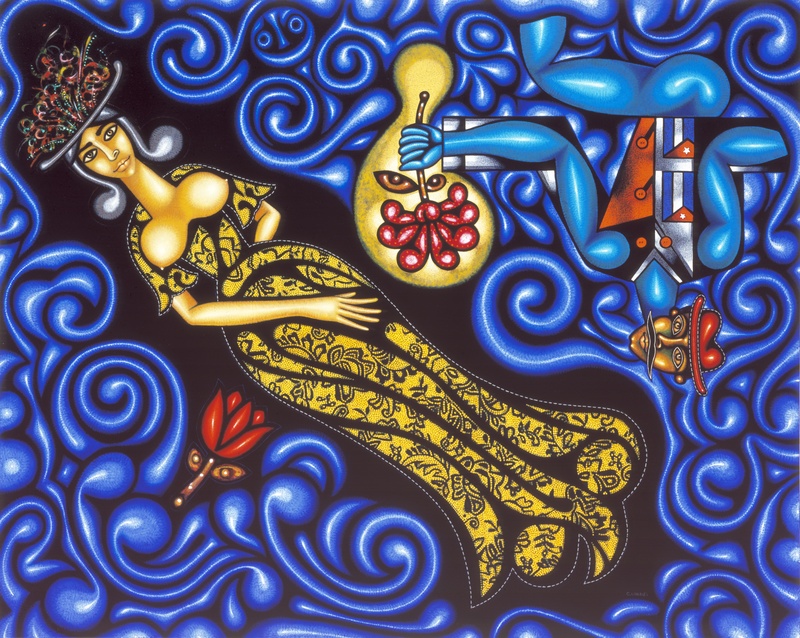 Carlos Luna’s painting “The Island’s Eggs” (17 1/2″ x 47″) ©1997 Carlos Luna. All Rights Reserved. AM: The plane also appears frequently in your paintings. CL: All Cuban people dream about the airplane because it is one safe way to go to freedom. I love the airplane. I love the idea that you fly. I feel scared when I get into an airplane, but the idea of the airplane for me is, “wow.” The imagination, the human creation is amazing. It’s worth living when you create things that can help other people. “Mr. 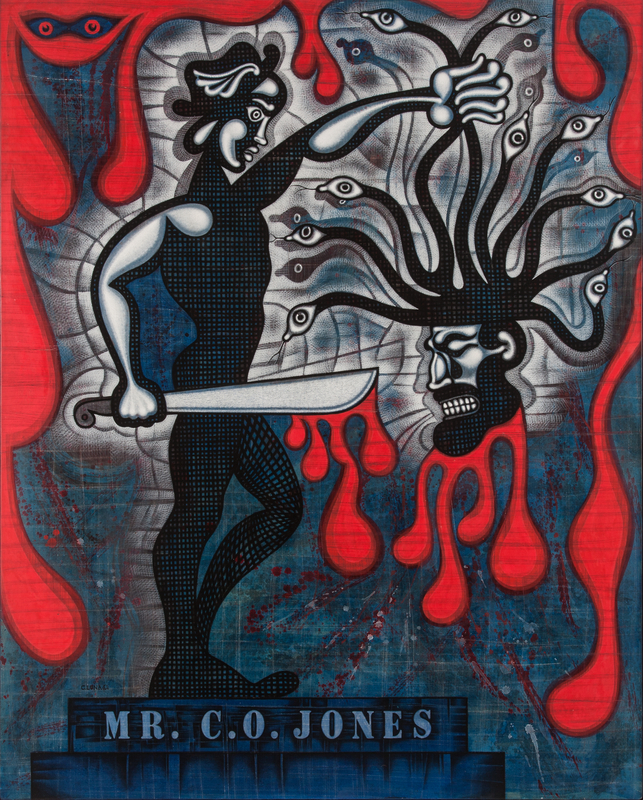 C. O. Jones” by Carlos Luna (mixed media on wood, 59″ x 47″) ©2012 Carlos Luna. All Rights Reserved. AM: Some of your work is critical of Fidel Castro. When did you feel free to be able to do that? CL: All my life I felt free. But I couldn’t feel comfortable and I couldn’t feel safe in Cuba. My father felt scared because when I was a child I said, “I can’t believe in this man.” I participated in the system and everything because I needed to survive. But my opinions and my ideas came to me very clear and very early. AM: Did you ever have any problems after you left Cuba because Castro appeared in your paintings? CL: Yes. A lot of people think Castro is a saint or a good leader of his country. I love Cuba, I love the Cuban people, but this is not my president. He does not represent my country. I have a different opinion of him. I don’t like Fidel. 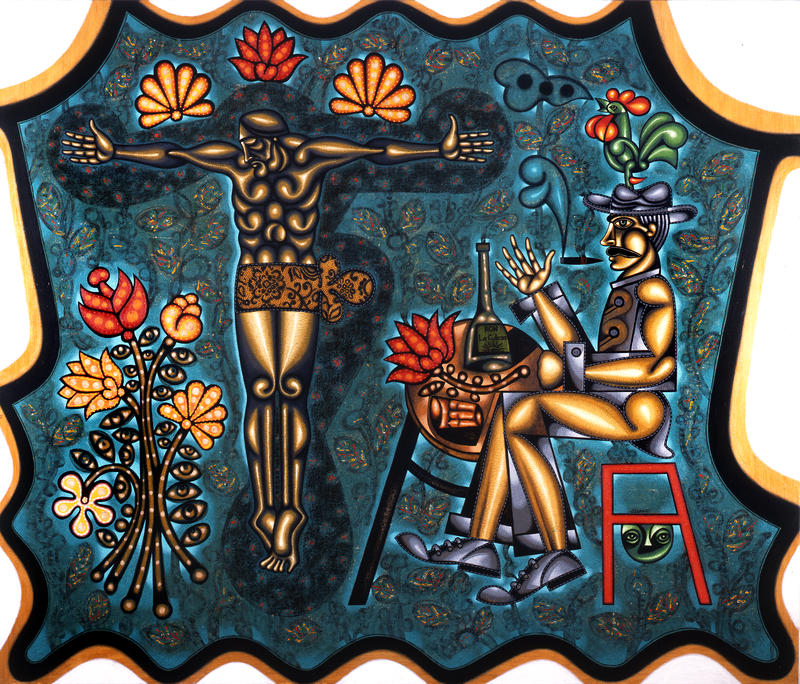 Carlos Luna’s work “My Life” (oil on canvas, 69″ x 90″) ©2009 Carlos Luna. All Rights Reserved. AM: Your paintings tell very strong stories but are also very decorative. Where does that come from? CL: Because I love beauty. Life is very rich and I receive inspiration in very different ways. For example, I enjoy it when my wife comes to me and says, “Oh, my love” and kisses me. Or “I have a coffee for you” or hot tea or a dinner. This, to me, is a beautiful moment. Or when I buy or take flowers from my garden for my daughter, my mother, or my wife, this is life too. I put all this decoration from my life into my work. AM: You have had a few exhibits of your work with Picasso ceramics. How did they come about? 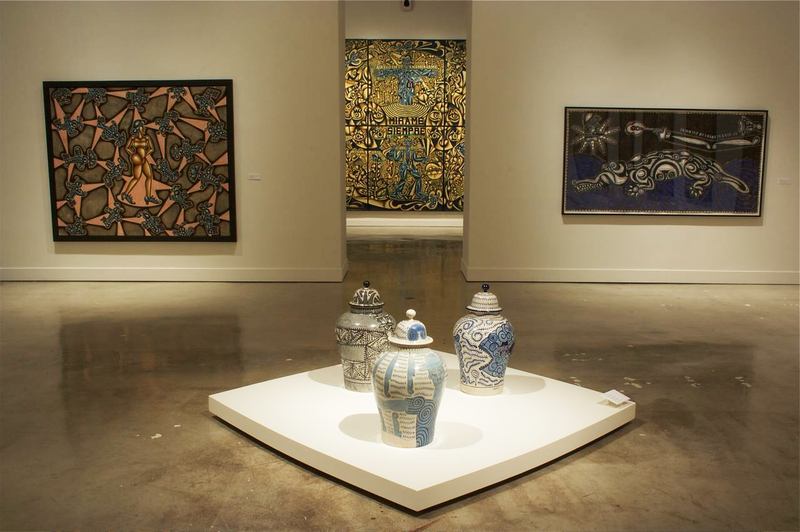 CL: The Fort Lauderdale Museum has an incredible collection of Pablo Picasso work in ceramics. One day, the chief curator, Annegreth Nill, called me. She needed an artist whose work could speak with Pablo’s work. Someone whose work was very intense and that would express themself as an artist. I was very surprised by that. But I accepted the challenge. I think it was a really good show for me. It was a huge show. All the museums that showed it gave me the main wings. The back view of “War-Giro” (War Hero). 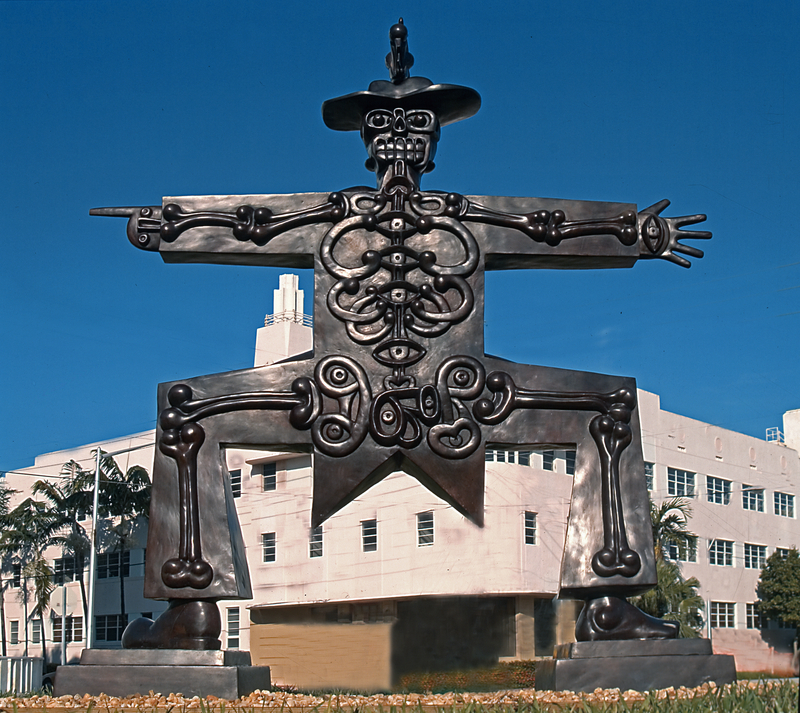 Luna created three of these monumental bronze sculptures, which are on display at the Museum of Latin American Art in Long Beach, CA, the Bass Museum of Art in Miami Beach, FL and Complejo Cultural BUAP in Puebla, Mexico. ©2005 Carlos Luna. All Rights Reserved. CL: We are preparing a travelling exhibition for different museums. Next year is the first step in this tour. I have worked for four years for this exhibition. We are working on this special project and other projects too. I am working in ceramics again. And I am making a huge sculpture – a public sculpture – for a museum and public place. And I am making an embroidery. I am using very different techniques – antique techniques too. I think in October or November next year in California there will be a huge show too. And in 2016 we will have a show in a museum in Latin America and Europe. We are working a lot. 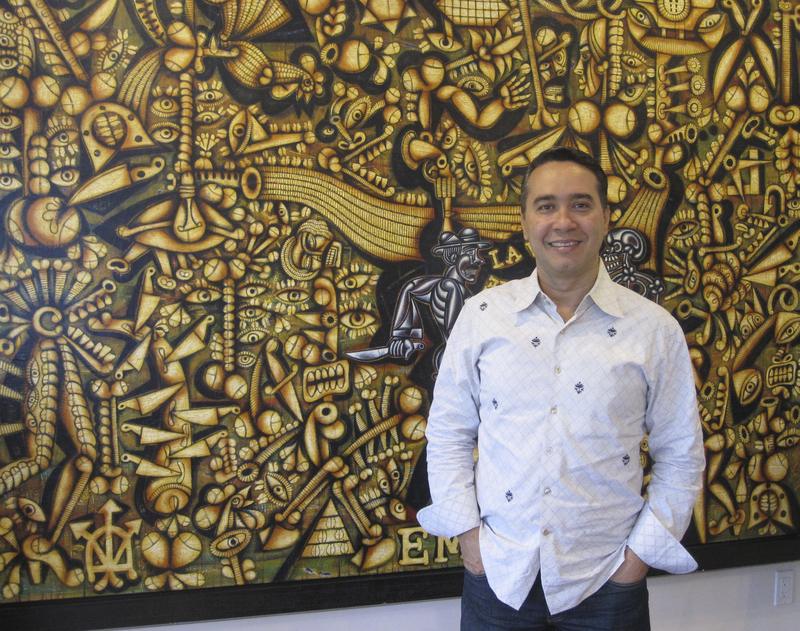 For more information about Carlos Luna and his work, please visit carlosluna.com. 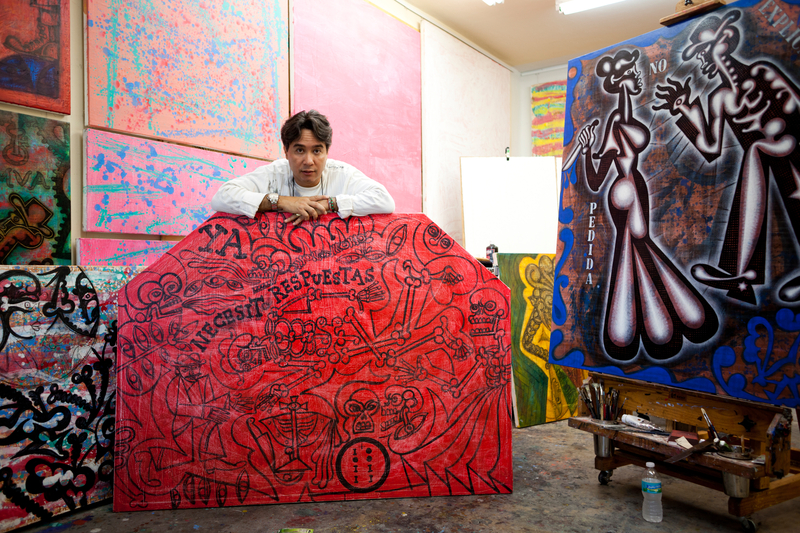 This entry was posted in ART and tagged Bass Museum of Art, Carlos Luna, Cuban American artist, Cuban American painter, Cuban artist, Cuban painter, Empingated, Interview with Carlos Luna, Miami artist, Miami painter, Museum of Art Fort Lauderdale, Museum of Latin American Art, Picasso ceramics. Bookmark the permalink. Wow, I really love his artwork!! I hope I can see it in person someday soon. Thanks for bringing him to my attention!